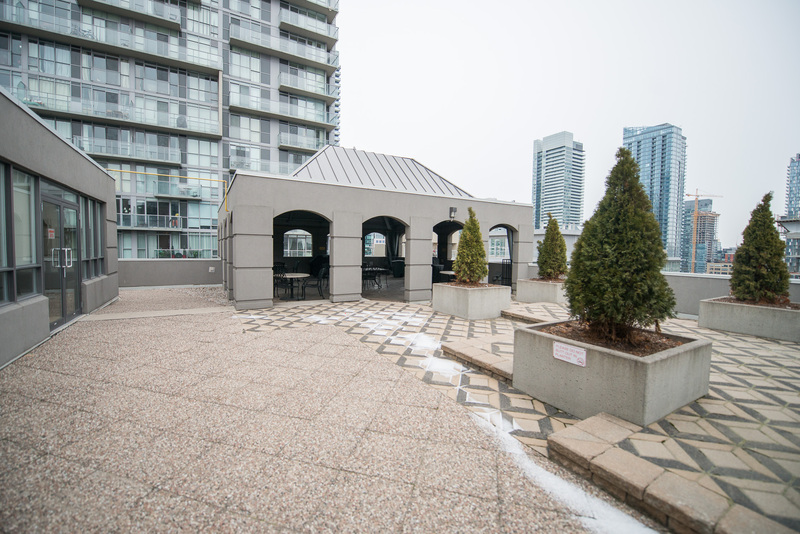 The University Plaza D Toronto furnished apartment comes equipped with all the necessities required during your furnished rental stay. 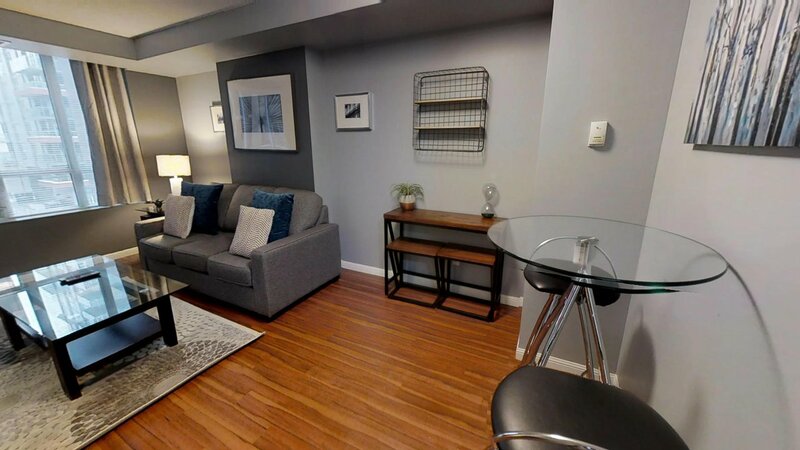 Nestled between the entertainment and financial district, this suite has a lot to offer: fully stocked, conveniently located and lots of great building amenities. The kitchen has full appliances and is uniquely partitioned away in the apartment as it’s own space. There are granite countertops, undermount sink and a rare kitchen – rarely found in Toronto condos. 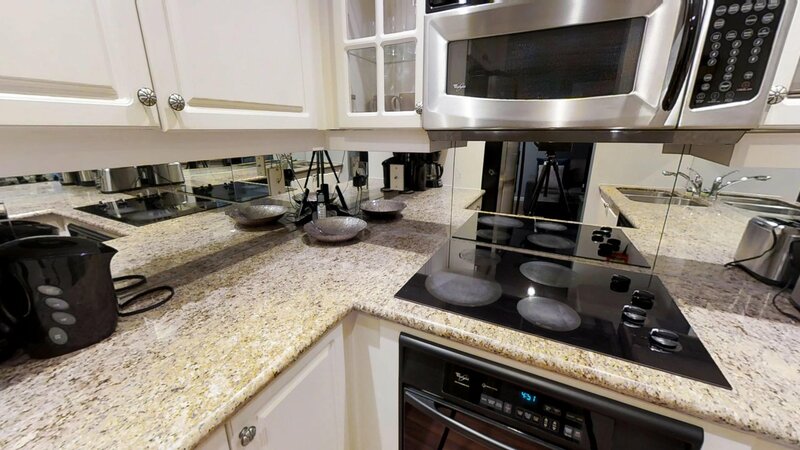 Small appliances, plates, pots and pans, flatware, glassware and kitchen utensils are also included. Upgraded cabinetry and engineered hardwood flooring completes this luxurious kitchen. The engineered hardwood continue throughout the main living area and bedroom. The main living area has dining for two, ample seating (including a sofabed), a flat screen TV and access to the balcony. As a guest, you can use the small workspace off to the side of the main living area. 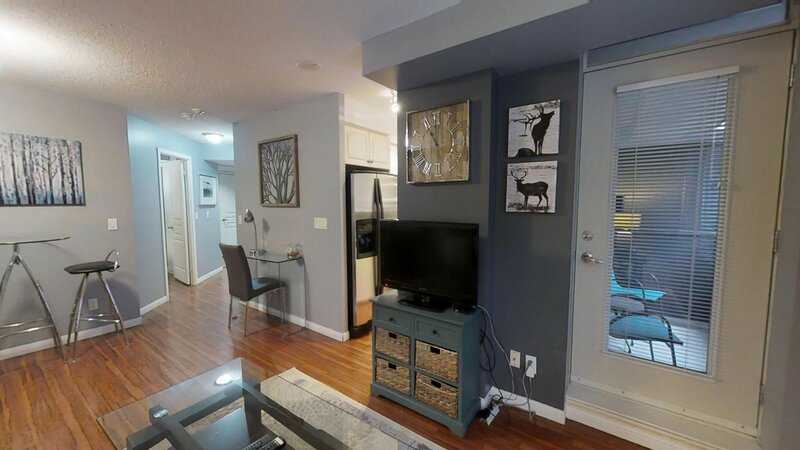 This furnished one bedroom condo has a queen sized bed and a closet in the bedroom. All linens are provided. 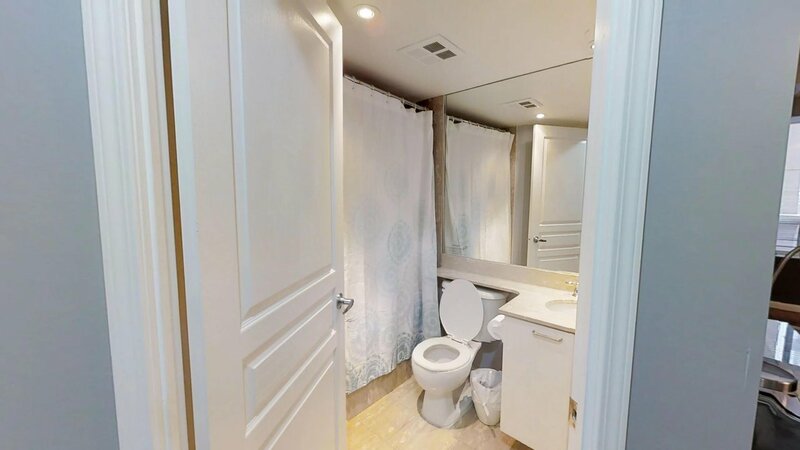 The bathroom is clean and modern, with towels included. The apartment also has a full-sized clothes washer and dryer. 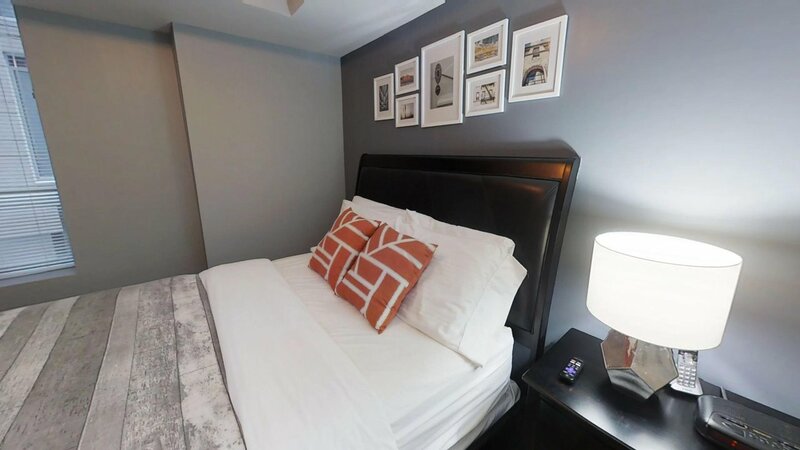 Available for short-term lease or long-term stays, this suite boasts a perfect walk score of 100, you can easily find anything you need right at your doorstep. Walk to: The Toronto Center of Performing Arts, Toronto City Hall, the Toronto Courthouses, the Financial District and much more. 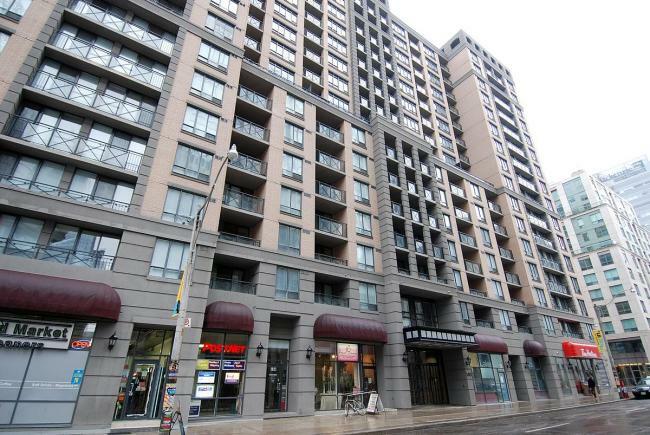 Located just steps from both St. Andrew and Osgoode subway stations, any part of downtown Toronto is accessible in minutes. For the colder months, a PATH entrance (access to Toronto’s underground PATH that spans the financial district and reaches as far as Union station) is a mere 2 minute walk away. After work, our corporate housing guests are steps from the lively King West district, which has some of the city’s best restaurants and lounges (a few blocks west of the building). 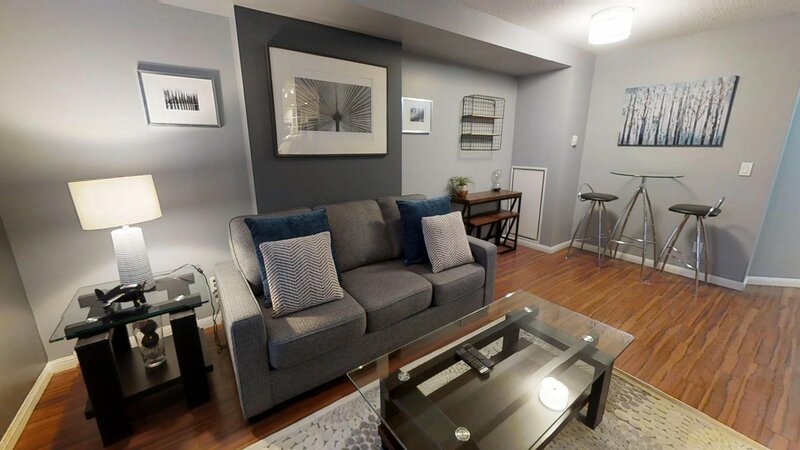 Guests at this furnished apartment will also enjoy easy access to Toronto’s best cultural and arts centers, including the Royal Alexandra Theatre, the Princess of Wales theatre, and for music lovers, the Roy Thomson Hall. This extended stay suite is sure to meet all of your needs with a vast array of on-site amenities, including well-appointed lobby entrance & waiting area (complete with a 24 hour security and a large gas fireplace). 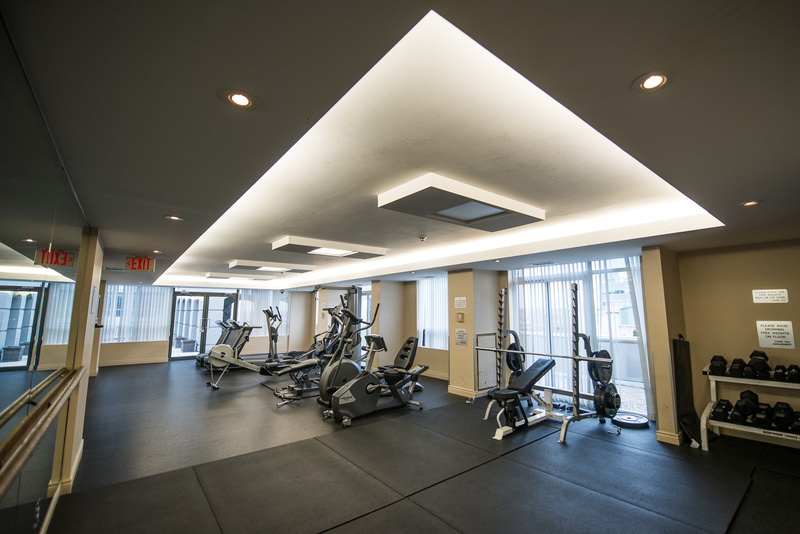 The building’s fitness centre is available to help you maintain your fitness goals, offering a choice of weight-lifting and cardio machines. Best of all, with SkyViewSuites, there are no hidden costs. 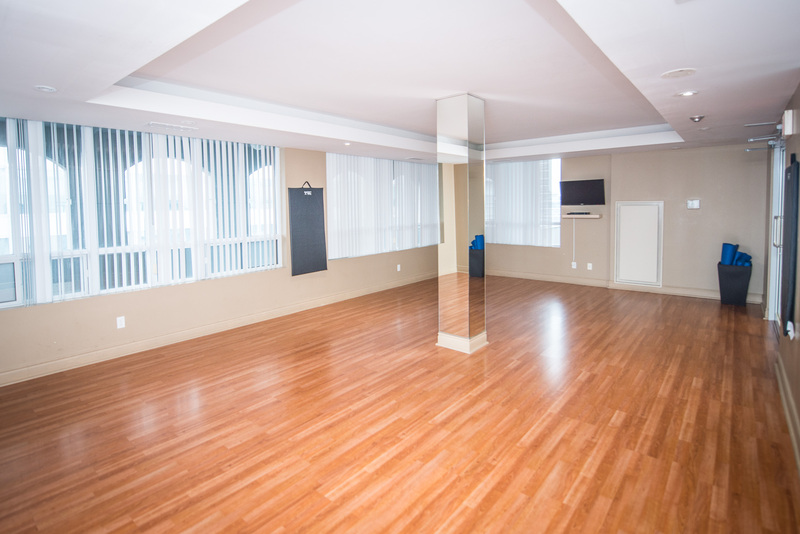 Free wireless internet, cable TV and bi-weekly maid service (once every 2 weeks) are included in the price.